"Don't upset anyone now. Bring this lad [Archer] in; he's got huge talent, huge potential, give him a go, keep the others on their toes and then make a decision. 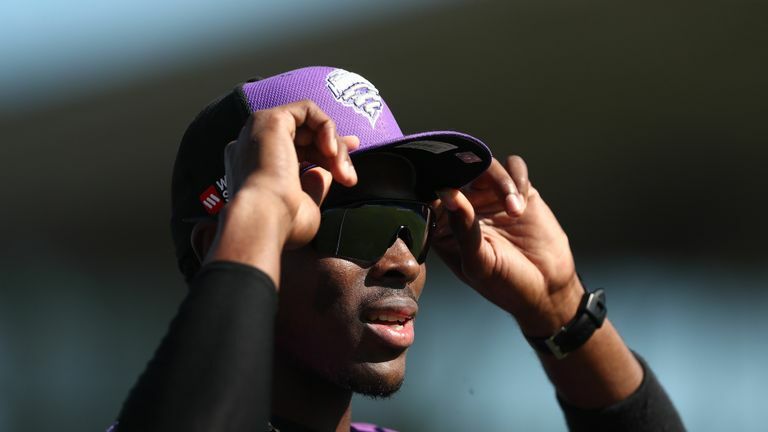 Don't go too early"
England's call not to include Jofra Archer in their preliminary 15-man squad for the ICC Cricket World Cup is "absolutely the right way to go", according to Sky Sports' Nasser Hussain. 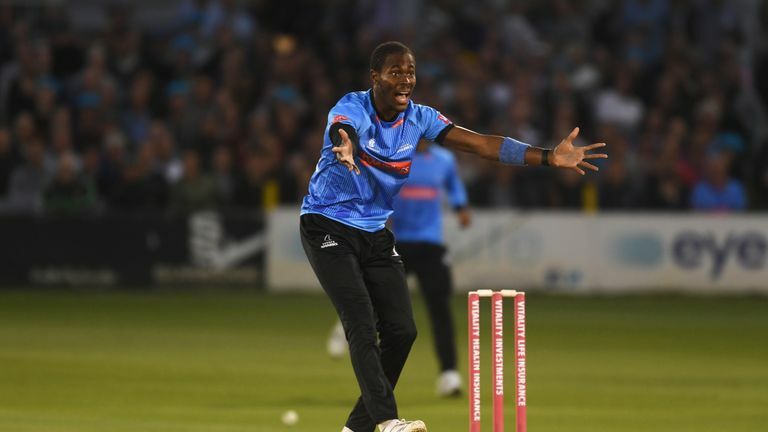 Archer has been added to a 17-man squad - along with Sussex team-mate Chris Jordan - to face Pakistan in a five-match ODI series prior to the World Cup, where he will have the chance to impress and possibly force his way in to the final squad that must be named by May 23. 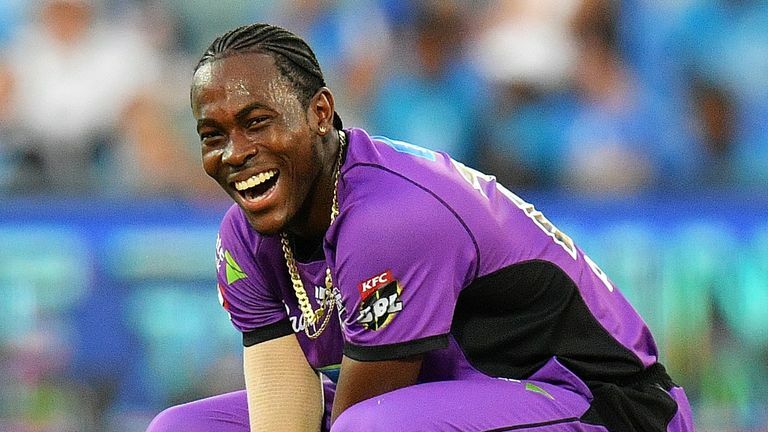 Jofra Archer has received his maiden ODI call-up but been overlooked for England's preliminary 15-man squad for the ICC Cricket World Cup. Archer and Jordan are also included in a 14-man group picked to play Ireland in a one-off ODI and Pakistan in a T20I in early May. Reacting to the squad announcement alongside former England coach and fellow commentator David Lloyd, Hussain told Sky Sports News he believes the move made by the selectors is the right one. "Don't upset anyone now," he said. "Bring this lad [Archer] in; he's got huge talent, huge potential, give him a go, keep the others on their toes and then make a decision. Don't go too early. "Why now, in this preliminary squad - which has no bearing, no meaning on the final squad - why show your hand now? "And why upset someone right now? Why tap on [Liam] Plunkett, [Tom] Curran or [David] Willey's shoulder, whoever, and say 'by they way, you're not involved'. "Bumble says he is going to be in it. But selectors have to be really careful, because if they had picked him in this squad, left someone out and hurt someone's feelings, what would then happen if he had an absolute shocker? "With young talent - and he's a very talented young man - the dips and the highs are a little bit more exaggerated, so he could indeed have a shocker on the highest stage. We've seen others who have had to wait their time for qualification and who have not really shone as well as people thought. "Then what would they do? They'd have picked him but then would have to leave him out. This is absolutely the right way to go. It keeps everyone on their toes. "For a number of World Cups, England have been trying to find 15 players - which ones to pick - and they're now wondering which one to leave out. Join us for the Ashes, ICC Cricket World Cup and Women’s Ashes and more on Sky's biggest ever summer of cricket! "Plunkett, over the last five or so ODIs his stats and his speed has gone in the wrong direction, but he gives you stuff in the middle overs. Willey gives you something up front. "At the end, England have a little bit of death bowling, but I'd pick Archer for his death bowling. I would not want Ben Stokes as my death bowler in a World Cup semi-final or final. "Archer eventually comes in for me, and for whoever is out of form. Remember the Champions Trophy in 2017, Jason Roy went into that tournament out of form - in a tournament, very rarely can you find form - and by the time England got to the semi-final, Roy was dropped and Jonny Bairstow came in. "Those three or four bowlers looking over their shoulder better be bowling well, because if one isn't and Archer is, you're gone and your World Cup dream is taken away from you." Bumble agrees with Hussain on Archer's omission from the preliminary squad, but does believe Archer will ultimately force his way into the group in time for England's first game against South Africa at The Oval on May 30. "He is an x-factor cricketer," Bumble added. "He is a terrific athlete and they're going to bed him into this team. It's no secret at all that he will end up in the final 15 - this just delays the inevitable. "It's the right way to go about it. They can have a look at him, and Jordan - who did really well in the West Indies - as they mix and match against Pakistan. "All eyes will be on that final 15, and Archer will be in it. He could be the missing piece of the jigsaw, but they're having a good look at him first. "He is a three-dimensional cricketer. A wonderful fielder and athlete, he can hit a cricket ball a long way, and he is a quick bowler. And I mean quick! One of the quickest in the world. "England are a wonderful team, and I think they're still favourites for this World Cup. They have a great squad, a really good leader in Eoin Morgan, and I think that selection has Morgan stamped all over it. "'We'll have a little look first, and then we'll get him in'." Michael Atherton joined Hussain and Bumble for the opening game of the Royal London One-Day Cup between Kent and Hampshire and also had his say on England's selection. "I think England have done it the right way round," said Atherton. "Show faith with the players that have got you to this point. "But they want to have a look at Archer, and they have to have a look at Archer. It's the first time that he's available to play since the regulations were changed. He completed his three-year qualification in March. "You can certainly question whether the regulations should have been changed from seven years to three but, once he is available, you've got to pick on merit and pick the best possible squad. "I think it is a near certainty that he will make the final squad. This is the World Cup we're talking about. England want to win the World Cup and so you've got to pick the best side available. "One or two people have said, 'isn't it disruptive to make a change on the eve of a tournament?' But, the point is, Archer hasn't been available before now. Had he been, he may well already be playing. "This is the first point the selectors have had a chance to pick him and they're right to have a look at him for sure."